This description from the 1851 catalogue of the Crystal Palace Exhibition in England tallies with the culmination of the popularity of the balloon-back chair in the 1850s in England and Canada. 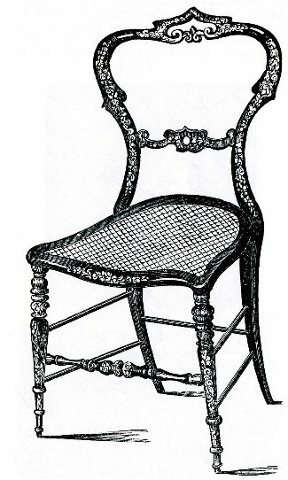 It had evolved to the point that the legs were shaped in the cabriole form of the Rococo Revival, and related in this way with the curvature of the back. 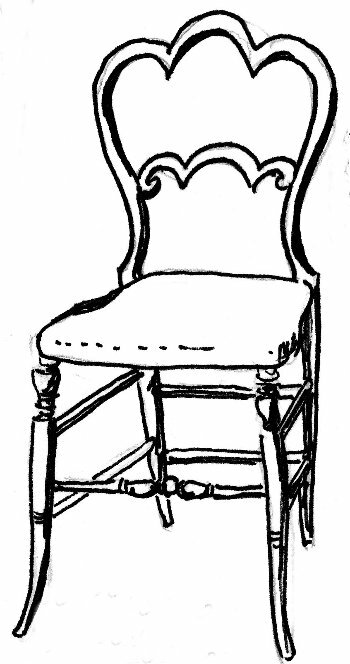 When the chair began in the 1830s, however, as illustrated in J.C. Loudons Encyclopaedia of Cottage, Farm, and Villa Architecture and Furniture (London, 1833-39), the front legs were straight, although the back ones curved out (below). No stretchers were felt to be necessary. Typical of the Regency style, the turnings of the front legs often incorporated an octagonal section with a bulbous knob at the top. Seats were upholstered in horsehair and might use a few buttons, which will in. crease in numbers as the Victorian style develops. The term balloon refers to the rounded shoulders of the back with its nipped-in waist and curved crosspiece. 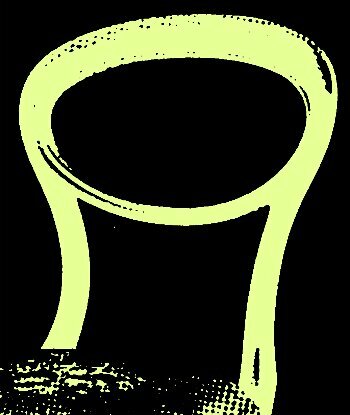 In Loudons design, the crest or upper rail is characteristic of the first stage due to its dipped effect. The Victorians waxed enthusiastically, if inaccurately, about the past. 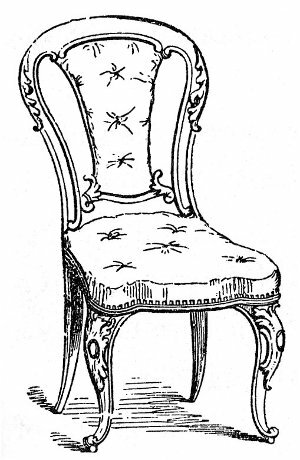 In fact Downing meant the style of Louis XV or Rococo (c1730 - c1760), which featured the cabriole leg. 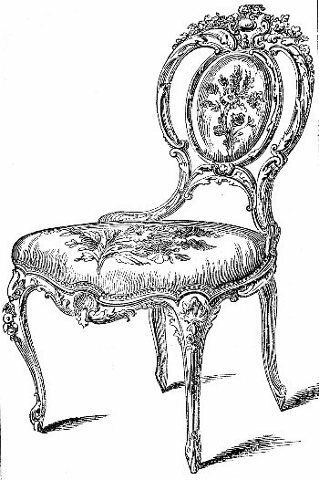 The intricacy of detail can be seen in the scrolled and naturalistic carvings on the chair (below left, 1851) with the upholstered panel back, a variant on the balloon-back theme. Its curved seat-apron features the rococo shell in the centre. 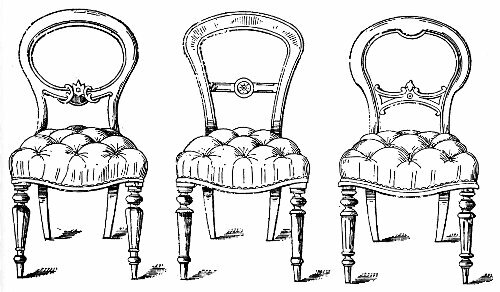 Caning in chairs seats became increasingly more popular (right, 1851). 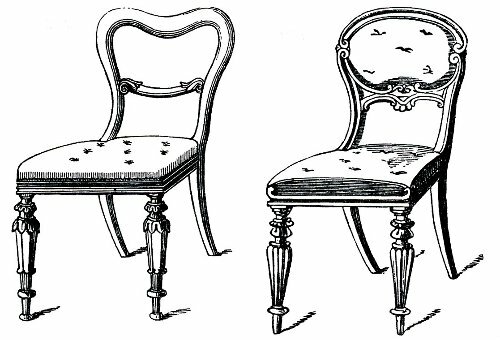 Also varying from the usual balloon-back is the chair with the heavy scrolls, an influence of the Empire style (right). 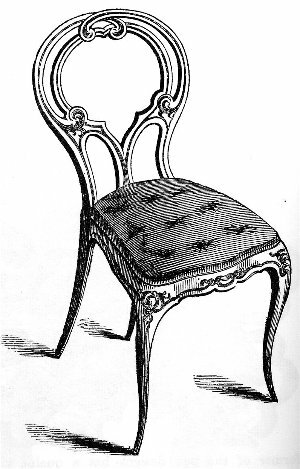 Another variant is the chair with the Gothic Revival (left) elements of cusps and foils on the back.